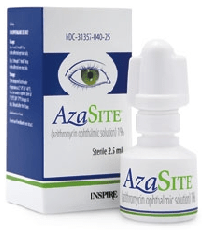 In addition to its antibiotic properties, Azasite has been shown to improve the quality of meibomian gland secretions, and may contribute to reduction in inflammation. Your doctor may prescribe Azasite with instructions to apply it to your eyelashes and lid margins for a period of time. Foulks GN, Borchman D, Yappert M, Kim SH, McKay JW.